The University of Western Australia (UWA) — where I am studying to become a doctor — will this Friday permit Quentin Van Meter of the American College of Pediatricians to speak on campus as part of a national tour with the Australian Family Association. This is the same University where I have been taught the scientific method, taught to base medicine on evidence, and taught to treat people with dignity and respect. 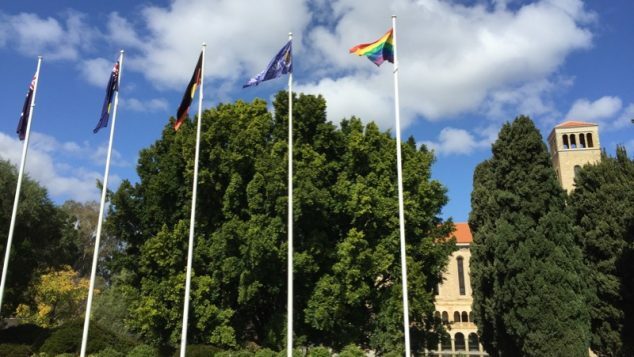 Something is seriously wrong – and UWA thinks a flag is all it needs to make everything better. So, what’s the fuss? The American College of Pediatricians (ACP) and the Australian Family Association (AFA) sound like perfectly benign organisations. Why shouldn’t Van Meter get to say what he wants? What’s so damning about that? And so the plot thickens. Well, firstly, there’s more in common between the ACP and AFA than the bland names — they’re also both nasty hateful anti-LGBT groups who promote ultra-conservative views on transgender people. The AFA are fans of that tried and true slippery slope that begins with marriage equality and ends with child molestation, and ACP are out against abortion, contraception, gay parenting, are fans of ‘gay cure’ therapy, believe that helping transgender children to transition is in itself a form of abuse, and have been identified by the Southern Poverty Law Center as a hate group. Jeepers. So there we have it, the perversion of science spelled out, the ACP follow science only so far as it discovers their predetermined truths. “The University faces a situation which confronts universities around Australia and in other countries. It arises when persons with views which significant sections of the University community find to be hurtful and offensive are invited to speak on campus. No resolution of such cases will satisfy all interests. There is, of course, a line to be drawn. While UWA makes a case for the balance between respect for human dignity and freedom of speech, they fail to consider the danger of the misrepresentation occurring. The ACP is an organisation deliberately created to lend false credibility to fringe ideas — they represent a few hundred doctors, in contrast to the 67,000 with the American Academy of Pediatrics, the actual peak body for Pediatrics in the USA. The ACP bend the science to fit the moral mould, and this is what make it dangerous for UWA to offer them a platform. An institution that trains doctors need to recognise a responsibility to give people truthful health information, based in faithfully conducted science. This responsibility is heightened when dealing with groups who face adversity, who are discriminated against, or who are at a disadvantage with regards to evaluating the information they receive. Transgender kids tick all these boxes, and a few more, and UWA should well and truly know it. Transgender kids and their families need our support, and they need quality information and care. They don’t need the ACP pushing their ultra-conservative fringe views as if they were common and mainstream, enabled by our most prestigious university. This is shameful stuff for the university. UWA’s response has so far been to internally email staff and students and have made their position clear — they intend to allow this event to go ahead on Friday. There is some hope, however, that UWA will publicly distance the University from Van Meter and the ACP, which might go some way to winding back the false credibility they have unfortunately leant to these anti-scientific and hateful ideas. Well UWA, flags are pretty — but they’re also pretty easy to put up. Actions are harder, but they speak louder. Thomas Drake Brockman is currently studying to be a doctor at the University of Western Australia. This week his petition against an event being held by the Australian Family Association attracted over 6500 signatures.